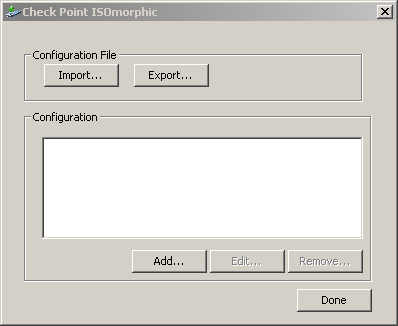 Effective January 23, 2019, the ISOmorphic package has been updated to Build 168. To install R80.20 releases, you must use the latest available build of the ISOmorphic Tool. 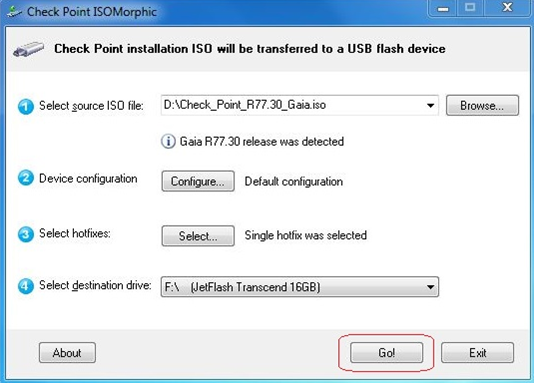 ISOmorphic is the Check Point utility used for creating a bootable USB device, capable of installing Gaia / SecurePlatform OS on Check Point appliances and Open Servers. For USB installation on IP Series Appliances, refer to sk83200 - Gaia installation on IPSO-based IP Series appliances from USB storage device. Starting from R77.20, ISOmorphic tool supports two modes of deployments - Regular and Unattended. Unattended deployment is a way to install the Gaia/SecurePlatfrom on the appliance without a need for interaction from the user performing the installation. This tool can be used as well to prepare Hardware diagnostic USB DoK. See sk97251 - Using the Check Point Appliance Hardware Diagnostic Tool for more info on the Hardware diagnostic tool. 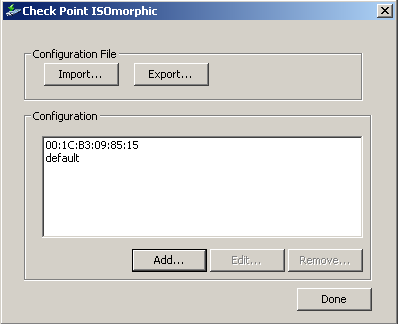 Check Point does not enforce the usage of ISOmorphic, which is provided as a utility to make the installation easier. 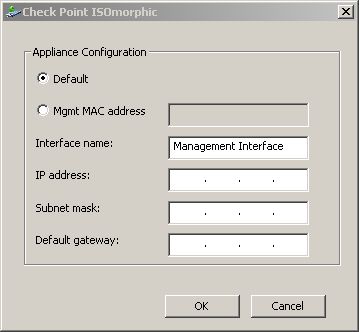 Note however, that Check Point has developed and verified the ISOmorphic tool to work with all Check Point appliances (excluding IP Series Appliances). A bootable USB device might fail to identify the Gaia image if it was formatted with a file system different from FAT32. 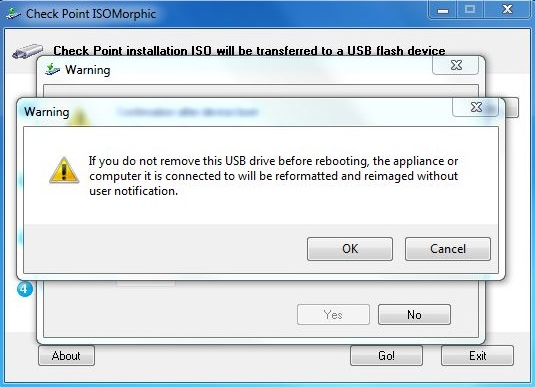 In such an exceptional case customers can use any tool they want to reformat a USB device before starting the ISOmorphic creation process. 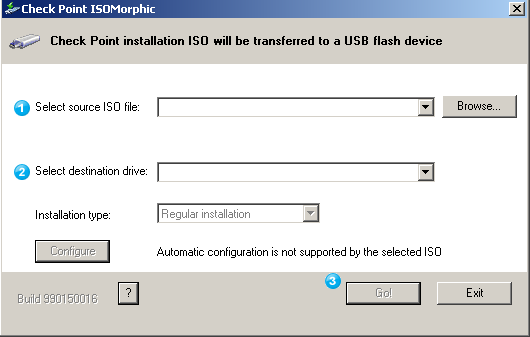 Verify that the USB device does not contain bad sectors before starting the ISOmorphic creation process. 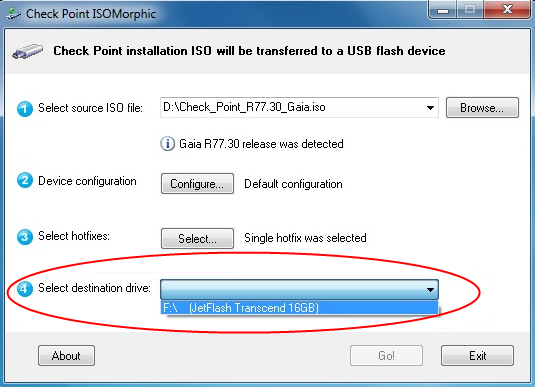 The Check Point ISO might not contain the required driver for the USB storage device. As a result, the installation might fail. The R77.30 Jumbo Hotfix Accumulator installation using the ISOmorphic Tool is not supported. IPSO OS and IP Series Appliances are not supported (see sk83200). VSX NGX R67.10 ISO is not supported. VMWare Virtual Machines are not supported. Only Gaia R77.20 and above are supported (no backward compatibility). New features are not supported on SecurePlatform OS. 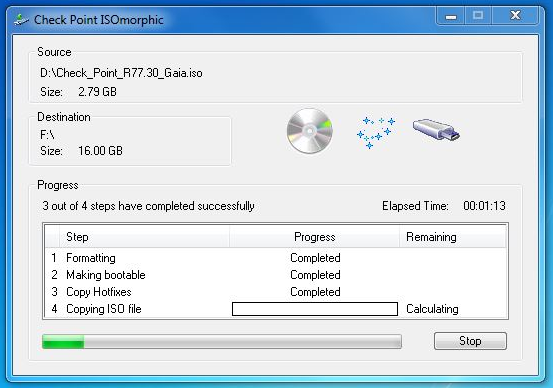 ISOmorphic can be used for fresh install only. Only public HotFixes and Jumbo HotFixes were tested. Test private HotFixes before deploying them to a new machine. Basic networking can be preconfigured only for Gaia R77.20 and above, and only for Check Point appliances. Basic/Advanced configuration and HFs installation (Enhanced ISOMorphic) are available only on 3000 / 5000 / 15000 / 23000 appliances with their R77.30 Gaia Clean Install package. On Smart-1 525, 5050, 5150 appliances, the post-installation reboot is stuck while the ISOmorphic USB is still plugged in and OS cannot be loaded. 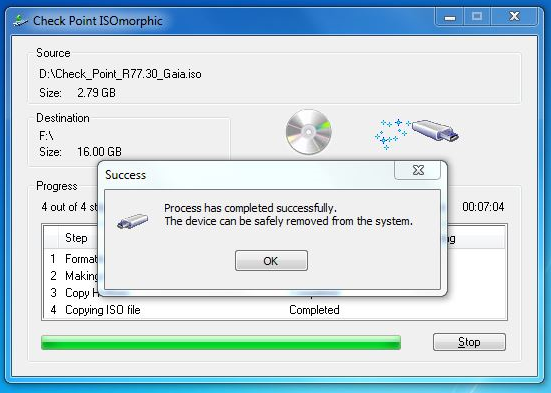 Important: Verify that the USB device does not contain bad sectors before starting the ISOmorphic creation process. In the 'Select source ISO file' field, browse for the Gaia / SecurePlatform ISO file. Press Configure in order to configure your devices. If you want to make this USB installation valid for any CheckPoint appliance, double-click the default entry (Any), or click the 'Add' button for a specific appliance. 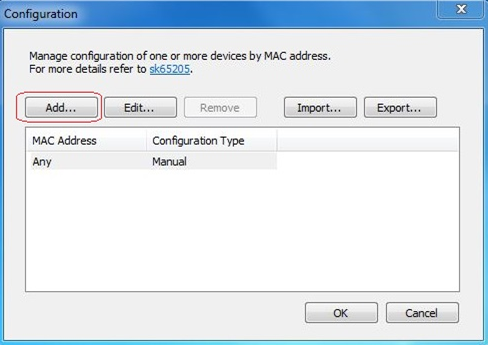 Type the MAC address of the device you want to install (in case of a specific device). Basic: You will be able to use pre-defined templates for Security Gateway, Security Management or Standalone (both). Select your product and provide the required info. 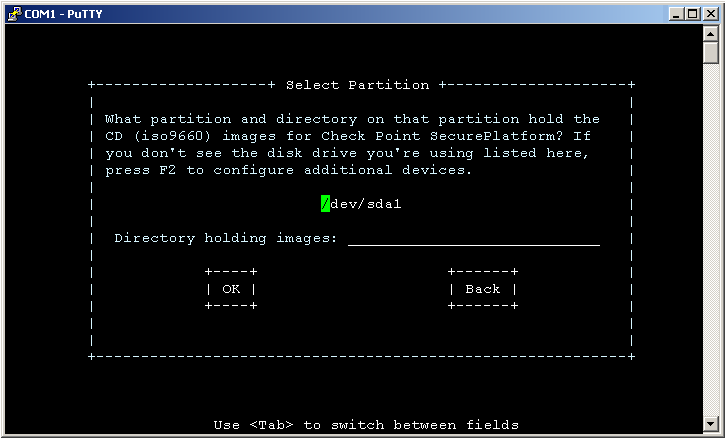 This will run First Time Wizard with the requested configuration after installation. Advanced: You will be able to provide a config_system configuration file of your own. This provides you with the means to install any type of Check Point product. First Time Wizard will run with the provided configuration (config_system) after installation. Manual: You will be asked to perform the First Time Wizard manually after installation completes. Note: you can choose to provide your own SIC key (in case of gateway installation) or Administrator password (in case of Management installation) and they will be written clear-text on the usb device. 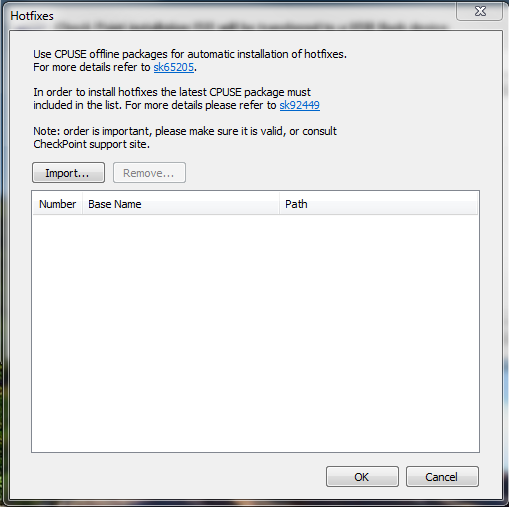 By default, the device will randomize these and you'll need to access it after installation and configure them yourself by using the 'cpconfig' command. Starting from R80, to change the Administrator password, use the mgmt_cli set administrator command. Refer to Management API Reference. Providing FTW settings to Isomorphic utility results in unattended running of config_system during both Gaia installation and appliance restore to factory defaults. Select the Additional OS configuration checkbox if you want some additional configuration to be applied after First Time Wizard (Basic/Advanced modes) or after after installation (Manual mode). This should be a valid clish script. Important Note: This clish script should not include any configuration that requires reboot. Now click the Import button and select your hotfixes. These should be CPUSE packages. Order is important, make sure it is valid, or consult Check Point support site. ISOmorphic tool will require to supply offline CPUSE agent tgz file in addition to requested Hotfixes. 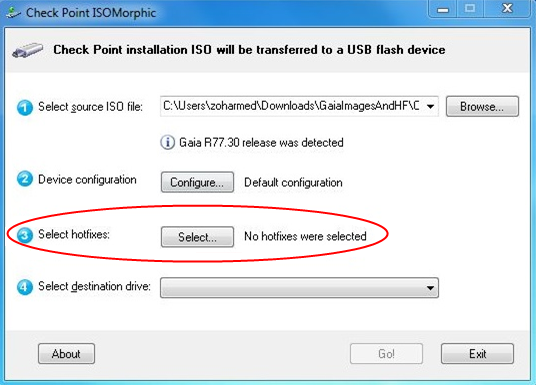 In the 'Select destination drive' field, select the USB device drive. This will completely erase the USB device. Type yes if youre sure you want to continue. The USB drive will be formatted and prepared. The progress window is displayed. Do not forget to unplug the USB device from your desktop computer after preparing it. Important Note: Otherwise, the local drive will be formatted without any user confirmation once your desktop is rebooted. 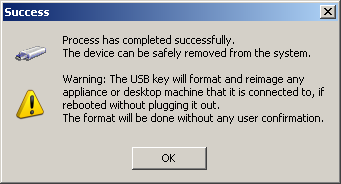 Prepare the USB device as instructed above. Make sure the Appliance/Open Server is turned off. Connect to the Appliance/Open Server over console (configure the standard connection - Rate 9600, Data Bits 8, Parity None, Stop bits 1, No Flow Control) or VGA. Connect the USB device to the Appliance/Open Server. Turn on the Appliance/Open Server. Note: If the machine did not boot from the USB device, then check that BIOS settings allow to boot from USB. 2-12 - according to the appliance model that is installed. If you selected Show confirmation before installation begins, then the default option is localdrive, i.e., the installation from USB device will be aborted and machine will boot from the local drive. If the 'Install automatically without confirmation option is selected, then you've already selected one of the options in the drop-down menu. LCD panel shows success message. Warning: Do not forget to unplug the USB device from the Appliance. 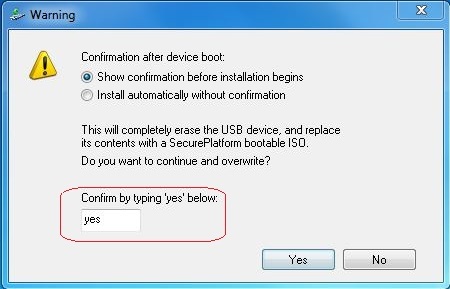 Otherwise, if you select the Install automatically without confirmation option when preparing the USB device, the local drive will be formatted without any user confirmation once the machine is rebooted. When restoring the appliance to factory defaults, the initial configuration parameters supplied to Isomorphic utility (Hostname, Admin password, IP address, Default gateway) will be used as default values. Providing product information in case of Basic and Advanced configuration type will result in unattended running of First Time Wizard after completing the appliance restore procedure. Regular Deployment is used to install Gaia / SecurePlatform OS interactively. Format the USB device as FAT32. Make sure you have the Gaia ISO file corresponding to the appliance model and the relevant release. In the 'Installation type' field, select 'Regular installation'. 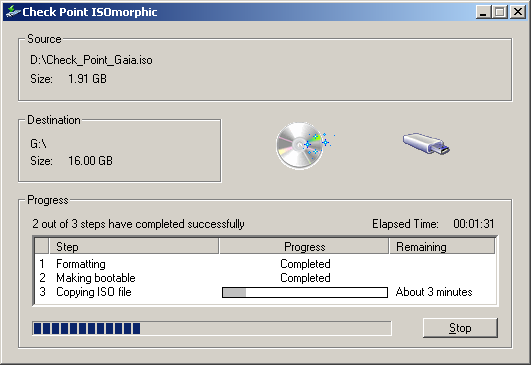 Starting in Gaia R77.20, basic networking can be preconfigured using the ISOmorphic tool. The tool saves the configuration on the USB device as an XML file, and applies it automatically on the appliance after installation. 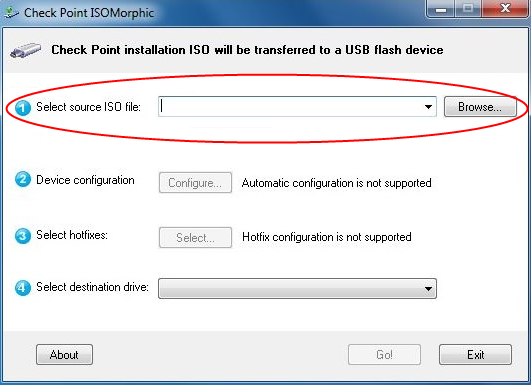 The ISOmorphic tool lets you save different configurations for different appliances on the same USB device. MAC address of the Management interface of the appliance to be configured, or default. During the deployment, the appliance searches for its MAC address in the XML configuration file. If the MAC address is not found, then the appliance applies the default configuration. Note: For Gaia / SecurePlatform ISO R77.10 and lower, this button is greyed out. Note: In this window, you can import a previously prepared configuration file (XML), or export the current configuration. Click on 'Add...' button to configure the basic networking settings. Note: Only one interface can be configured on the same appliance. Type the name for the interface name. Enter the default gateway (optional). Note: If you want to use the same USB device for multiple appliances, then select the 'Mgmt MAC address' option before you enter the configuration settings. When an appliance with the specified MAC address is being installed from the USB device, the pre-configured settings are applied to it. If the appliance's MAC address does not match the MAC address in the tool's configuration file, then the default settings are applied (if a default configuration exists). Click on 'OK'. You return to the previous window. You can now reiterate and add more configurations with different MAC addresses (or default, if not configured yet). 1) Only Gaia R77.20 and above are supported (no backward compatibility). 2) Only one interface can be configured on the same appliance. 3) Only Check Point appliances are supported (excluding IP Series Appliances). 4) New features are not supported on SecurePlatform OS. 5) IPSO OS is not supported. 6) Open Servers are not supported (the installation will prompt the user for the configuration). 7) VMWare Virtual Machines are not supported (the installation will prompt the user for the configuration). In the main window, click on 'Go!' button at the bottom. The USB drive is formatted and prepared. The progress window is displayed. Continue to section "Installing Gaia / SecurePlatform OS on the Appliance / Open Server using the USB device". Unattended Deployment is used to install Gaia OS on Check Point appliances without any user input. Make sure you have the Gaia ISO file corresponding to the appliance model and the relevant release. In the 'Installation type' field, select the 'Unattended installation'. 4) SecurePlatform OS is not supported. Important Note: Otherwise, the local drive will be formatted without any user confirmation once the machine is rebooted. Prepare the USB device either for Regular Deployment, or for Unattended Deployment (supported only on Check Point appliances). Make sure the Appliance / Open Server is turned off. Connect to the Appliance / Open Server over console (configure the standard connection - Rate 9600, Data Bits 8, Parity None, Stop bits 1, No Flow Control). Connect the USB device to the Appliance / Open Server. Turn on the Appliance / Open Server. If you selected 'Regular installation' type, then the default option is localdrive, i.e., the installation from USB device will be aborted and machine will boot from the local drive. If you selected 'Unattended installation' type, then the default option is serial. Note: Usually, you should select the last option on the list. The interfaces blink in a round-robin fashion. Warning: Do not forget to unplug the USB device from the Appliance. Otherwise, if you have used the 'Unattended installation' type for preparing the USB device, the local drive will be formatted without any user confirmation once the machine is rebooted. 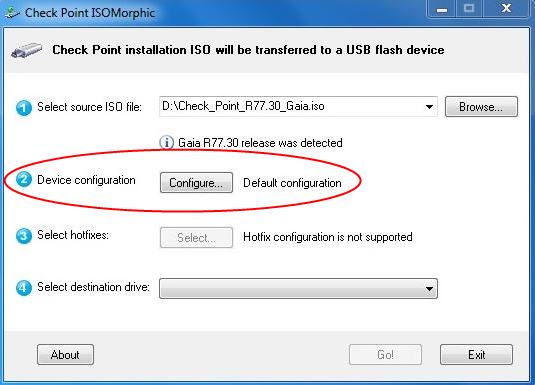 An experienced administrator prepares a USB device with configurations for an unattended R77.20 installation. An experienced administrator sends the USB device to a remote office site. Connects the network cables to the appliance. Connects to the appliance over console. Connects the USB device to the appliance. Waits until the installation succeeds (as shown on the LCD panel, or by blinking interfaces lights). Removes the USB device from the appliance. An experienced administrator connects remotely to the appliance over SSH, or to Gaia Portal and continues the configuration (e.g., First Time Configuration Wizard). Busybox that is used for ISO installation from USB device was not compiled with 64-bit file-offsets (_FILE_OFFSET_BITS=64). The ramdisk on the USB device mounts the ISO image, and then mounts 'stage2.img' from the ISO image, afterwards it unmounts the ISO image, and 'stage2.img' remounts the ISO. When 'stage2.img' is running, the 'find' command complains when it sees an ISO file larger than 2 GB. This message can be safely ignored. The installation completes successfully, and installed software works correctly.